Updated July 23, 2014: Thanks to our partners who came out. See pictures and partners list here. NOTE TO MEDIA: If you are planning to attend the rip current research demonstration in Carolina Beach on July 23 and have questions, please contact Katie Mosher at 919-270-4962. The research will continue in rain, but will be canceled for thunder/lightning. Spencer Rogers. Photo by Bob Humphrey. A partnership that includes researchers from North Carolina and Australia is bringing new perspective and data to better understand rip current on beaches of the United States’ East Coast. Spencer Rogers, Sea Grant coastal construction and erosion specialist, anticipates the results will differ from the more permanent rip currents studied on the U.S. West Coast and Great Lakes, and in Australia. Partners for the North Carolina research project include the National Weather Service coastal forecast offices, and local communities’ lifeguards. 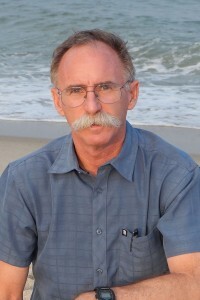 They are joined by Rob Brander — known as Dr. Rip in Australia — who is a coastal geomorphologist at the University of New South Wales in Sydney. 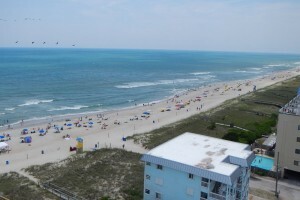 Aerial view of rip currents at Carolina Beach. Photo by Spencer Rogers. Based at the North Carolina Sea Grant office at the University of North Carolina Wilmington’s Center for Marine Science, the team is deploying data-logging drifters to document the velocity, circulation and ejection frequency of rip currents. Initial testing has been done at Carolina Beach. The crew will be on call to respond to rip current reports from New Hanover County lifeguards. In a few weeks, they will work with lifeguards and other partners on the Outer Banks. Rogers is among the national Sea Grant network representatives on a rip current task force that includes the National Oceanic and Atmospheric Administration and the U.S. Lifesaving Association. The group has developed a national awareness campaign and shares research results. UNCW graduate student, Cobi Christiansen deploys a drifter. Photo by Spencer Rogers. “If people know what to do if they are caught in a rip current, they are more likely to protect themselves and continue to have a good day at the beach,” Rogers notes. Rip currents are the leading hazard for all beachgoers. 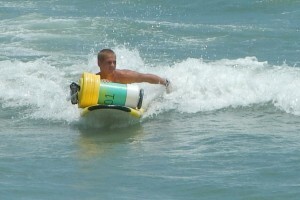 The National Weather Service reported at least seven fatalities due to rip currents along the North Carolina coast in 2013. “I’m very keen to help out with methods to evaluate the effectiveness of the Break the Grip of the Rip campaign here in the United States,” Brander adds. To learn more about the research, download Exploring Rip Currents. For more information on the ongoing national Break the Grip of the Rip campaign, go to ripcurrents.noaa.gov. For information on Rob Brander’s programs in Australia, go to www.scienceofthesurf.com.